This article is about Gauss's law concerning the magnetic field. For analogous laws concerning different fields, see Gauss's law and Gauss's law for gravity. For Gauss's theorem, a mathematical theorem relevant to all of these laws, see Divergence theorem. Gauss's law for magnetism can be written in two forms, a differential form and an integral form. These forms are equivalent due to the divergence theorem. The name "Gauss's law for magnetism" is not universally used. The law is also called "Absence of free magnetic poles"; one reference even explicitly says the law has "no name". It is also referred to as the "transversality requirement" because for plane waves it requires that the polarization be transverse to the direction of propagation. where ∇ · denotes divergence, and B is the magnetic field. Definition of a closed surface. 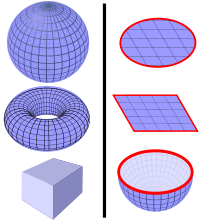 Left: Some examples of closed surfaces include the surface of a sphere, surface of a torus, and surface of a cube. The magnetic flux through any of these surfaces is zero. Right: Some examples of non-closed surfaces include the disk surface, square surface, or hemisphere surface. They all have boundaries (red lines) and they do not fully enclose a 3D volume. The magnetic flux through these surfaces is not necessarily zero. where S is any closed surface (see image right), and dA is a vector, whose magnitude is the area of an infinitesimal piece of the surface S, and whose direction is the outward-pointing surface normal (see surface integral for more details). The left-hand side of this equation is called the net flux of the magnetic field out of the surface, and Gauss's law for magnetism states that it is always zero. The integral and differential forms of Gauss's law for magnetism are mathematically equivalent, due to the divergence theorem. That said, one or the other might be more convenient to use in a particular computation. The law in this form states that for each volume element in space, there are exactly the same number of "magnetic field lines" entering and exiting the volume. No total "magnetic charge" can build up in any point in space. For example, the south pole of the magnet is exactly as strong as the north pole, and free-floating south poles without accompanying north poles (magnetic monopoles) are not allowed. In contrast, this is not true for other fields such as electric fields or gravitational fields, where total electric charge or mass can build up in a volume of space. The vector field A is called the magnetic vector potential. This arbitrariness in A is called gauge freedom. The magnetic field B, like any vector field, can be depicted via field lines (also called flux lines) – that is, a set of curves whose direction corresponds to the direction of B, and whose areal density is proportional to the magnitude of B. Gauss's law for magnetism is equivalent to the statement that the field lines have neither a beginning nor an end: Each one either forms a closed loop, winds around forever without ever quite joining back up to itself exactly, or extends to infinity. If magnetic monopoles were discovered, then Gauss's law for magnetism would state the divergence of B would be proportional to the magnetic charge density ρm, analogous to Gauss's law for electric field. For zero net magnetic charge density (ρm = 0), the original form of Gauss's magnetism law is the result. The modified formula in SI units is not standard; in one variation, magnetic charge has units of webers, in another it has units of ampere-meters. So far, no magnetic monopoles have been found, despite extensive search. This idea of the nonexistence of magnetic monopoles originated in 1269 by Petrus Peregrinus de Maricourt. His work heavily influenced William Gilbert, whose 1600 work De Magnete spread the idea further. In the early 1800s Michael Faraday reintroduced this law, and it subsequently made its way into James Clerk Maxwell's electromagnetic field equations. ^ a b Chow, Tai L. (2006). Electromagnetic Theory: A modern perspective. Jones and Bartlett. p. 134. ISBN 0-7637-3827-1. ^ a b Jackson, John David (1999). Classical Electrodynamics (3rd ed.). Wiley. p. 237. ISBN 0-471-30932-X. ^ Griffiths, David J. (1998). Introduction to Electrodynamics (3rd ed.). Prentice Hall. p. 321. ISBN 0-13-805326-X. ^ Joannopoulos, John D.; Johnson, Steve G.; Winn, Joshua N.; Meade, Robert D. (2008). Photonic Crystals: Molding the Flow of Light (2nd ed.). Princeton University Press. p. 9. ISBN 978-0-691-12456-8. ^ Schilders, W. H. A.; et al. (2005). Handbook of Numerical Analysis. p. 13. ISBN 978-0-444-51375-5. ^ Jackson, John David (1999). Classical Electrodynamics (3rd ed.). Wiley. p. 180. ISBN 0-471-30932-X. ^ Moulin, F. (2001). "Magnetic monopoles and Lorentz force". Il Nuovo Cimento B. 116 (8): 869–877. arXiv:math-ph/0203043. Bibcode:2001NCimB.116..869M. ^ Jackson, John David (1999). Classical Electrodynamics (3rd ed.). Wiley. p. 273, eq. 6.150. ^ See for example equation 4 in Nowakowski, M.; Kelkar, N. G. (2005). "Faraday's law in the presence of magnetic monopoles". Europhysics Letters. 71 (3): 346. arXiv:physics/0508099. Bibcode:2005EL.....71..346N. doi:10.1209/epl/i2004-10545-2.